In a move that many New England Patriots fans were expecting, but could never possibly be prepared for, Rob Gronkowski has officially announced his retirement from the NFL. After sitting out the 2018 season, there were a lot of questions about Le’Veon Bell’s future. His relationship with the Steelers seemed to be deteriorating by the day, and now we know for sure that Pittsburgh will let Bell become an unrestricted free agent. There was always a chance that the Steelers would franchise tag him for yet another season, but after the emergence of James Conner in 2018 it became clear that the Steelers didn’t need to pay up to get a good running back. However, there’s a long list of teams who would love to add an elite offensive weapon like Bell to their lineup, so let’s take a look at the most likely teams that Bell could sign with. Apparently, a bunch of NFL executives are already saying the Bell to the Jets is a sure thing. They need a running back, they have the cap space, and bringing in a player who is able to carry an offense the way that Bell can will definitely take some of the pressure off of Sam Darnold as he becomes comfortable in the NFL. The tough part might be convincing Bell to join a team that isn’t very good. Earlier this season a fan tweeted that he should come to the Jets for $60 million, but Bell responded saying that $60 million isn’t enough to come to New York. I mean, you’re basically guaranteed not to make the playoffs and get smoked by the Patriots twice a year. Not exactly an ideal situation. The Colts are in a similar situation to the Jets. They don’t really have a #1 running back, and giving Andrew Luck another target in addition to TY Hilton immediately improves their chances in the sometimes good, sometimes bad AFC South. 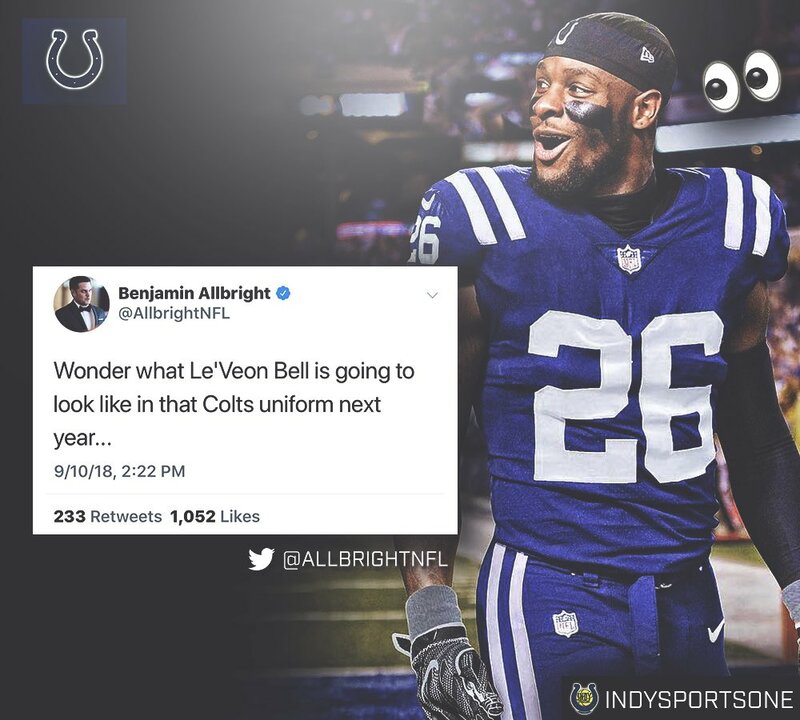 Bell has hinted at his interest in joining the Colts, commenting “just imagine” on a post about Luck throwing for at least three touchdown passes in eight straight games. The Colts will have about $120 million in cap space this offseason, so Bell to the Colts is definitely possible. It also helps that the Colts are good and still improving. After a slow start to the year, Andrew Luck got back to his pre-injury form, and they even won a playoff game this year. Bell could turn the Colts into one of the top teams in the AFC. The Eagles were ready to trade for Bell earlier this season, but no deal could be made until Bell signed his franchise tag which never ended up happening. Now that Bell is going to hit the open market, should the Eagles make a move for him? Jay Ajayi won’t be under contract with them next season, and without Nick Foles on the roster the Eagles have even more cap space to work with. Bell would definitely be a worthwhile addition to a team that is in the middle of their window to contend for a Super Bowl, and could be the missing piece that gets them back to being one of the top teams in the NFC. This one is a bit more off the board, but it makes a lot of sense the more you think about it. While Bell was sitting early in the season, he was spending his time down in Miami. With Kenyan Drake as the only running back under contract for the 2019 season, the Dolphins could be in a position to make a big splash this offseason. The Dolphins aren’t exactly in a position to be a solid playoff contender anytime soon, and similar to the Jets they’re also going to lose to the Patriots twice a year, so it might take a little bit of extra money to convince Bell to sign, but if he values money over winning, then Bell to Miami seems to make a lot of sense. Another edge that Miami has over New York is the weather. Do you want to deal with snowstorms, or enjoy some sun in Miami all year long? Seems like a no brainer to me.